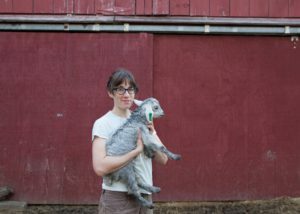 Abby Sadauckas, a farmer and agricultural service provider of Bowdoinham, has joined the regional group Land For Good. She will help tackle the growing needs of Maine farmers for access to land, support for farm succession and transfer, and more secure land tenure. 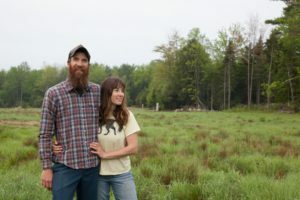 Nearly one-third of Maine’s farms and farmland are expected to change hands in the next decade, and access to land is a top challenge facing new and beginning farmers in Maine and nationwide. Sadauckas will work statewide to provide direct assistance and training to farmers, farm families and farmland owners who are seeking land, want to plan a farm transfer or want to make land available for farming. Land For Good is a New England-wide nonprofit whose mission is to ensure the future of farming in the region by putting more farmers securely on more land. Sadauckas will also work with Land For Good’s numerous Maine collaborators – like Maine Farmland Trust, The Maine Organic Farmers and Gardeners Association (MOFGA), University of Maine Cooperative Extension, Cultivating Community, among others. Sadauckas is a long-time collaborator of Land For Good, as well as a former organizational and farmer-client. Her professional work combines her experiences as a new farmer with her work as an agricultural service provider. 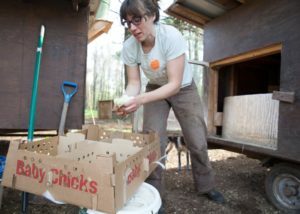 Abby acts as the course facilitator for MOFGA’s Farm Beginnings, a farmer-led, community-based whole farm planning course. She has worked for the University of Maine Cooperative Extension as the manager for a project focused on improving relationships for farm success. Sadauckas is a board member of Bowdoinham Community Development Initiative (BCDI) and serves on the steering committee of Slow Money Maine. Sadauckas and her fiancé, Jake Galle, run Apple Creek Farm. The farm produces MOFGA certified organic, grass-fed beef, goat and lamb, as well as certified organic eggs and poultry (broilers, geese and turkeys). They market their products year-round in nearby Brunswick at farmers’ markets. While beginning farmers often struggle with access to farmland, a related challenge is Maine’s aging farmer population. Nearly one-third of the state’s farms and farmland are owned and managed by farmers at or beyond retirement age (US Census of Agriculture). Farmers age 65 and older operate nearly 30% of the state’s farms. These senior farmers manage 527,000 acres and own a collective $1 billion in land and agricultural infrastructure, much of which may transfer ownership in the next decade. Yet less than 10% of them have someone under age 45 farming alongside them. Most are likely without an identified successor or succession plan, according to a 2016 study by American Farmland Trust and Land For Good (Gaining Insights). What these farmers do with their land and other farm assets as they exit farming will shape Maine’s agricultural landscape for generations to come.